Back in 2008, Evan Spiegel met Reggie Brown, during the freshman year. The same year they joined together the Kappa Sigma fraternity house of Stanford. There they met Bobby Murphy. By the end of the summer, the app only had 127 users! The name was changed in Snapchat in the fall of 2011. However, the app soon started to get tracion. In less than a year, by the spring of 2012, Snapchat had 100,000 users. The first investment arrived in April 2012, when a venture capital firm made its first seed investment by valuing the company at $4.25 million. By the spring of 2013 more than 60 million snaps were sent each day. The pace of growth accelerated in June 2013 the valuation of the company (after other two investment rounds) grew to $800 million. 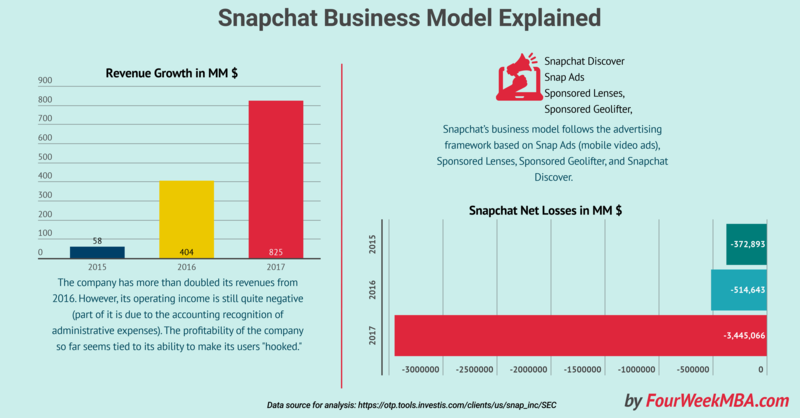 Snapchat added new features (like Snapchat stories) which made the company grow even faster. The incredible thing about this story is that Mark Zuckerberg is reported to have offered $3 billion to acquire Snapchat, although at the time the company didn’t turn a dollar in revenue. In December 2013 the company valuation reached $2 billion. By the same time, Snapchat had over 4.6 million users. Finally, on June 2015, Snapchat came up with the first monetization strategy. The uses of Geofilters to allow businesses to brand themselves through advertising. Currently, On-Demand Snapchat Geofilters are only available in the USA, UK and Canada and the area you select must be less than 5 million square feet. Just like Google allows businesses to bet on keywords. Businesses can create their Geofilters based on location and track the results of those Ggeofilters. In January 2017 the company starts to work on an IPO which valued the company $24bln at $17 per share. At the time of this writing, Snapchat is valued at the same rate of its IPO. Even though back in August 2017 the stock had fallen to its minimum at $11.83. The cost for Snap Ads varies by campaign. The cost for Snap Ads campaigns start at $3,000/month in ad spend. This obviously does not include the agency fee, or the cost to create the creative that you would run as the ad. The cost for Sponsored Lenses varies depending on the day of the week, holiday, trends, etc. A general rule of thumb for Snapchat Sponsored Lenses costs is this: $450,000 per day Sunday through Thursday, $500,000 for Fridays and Saturdays, and $700,000 plus for holidays or special events (like the Super Bowl). The cost might seem crazy unless you consider that those ads can add up to hundreds of millions of views! Those are visuals set up on a localization basis. According to blog.hootsuite.com, they can cost as low as $5. Snapchat Discover ads are the most expensive offering. Right now, Snapchat discover ads start at $50,000. Snapchat Discover ads get premium placement (at the very top of the app), and are usually reserved for publishers or big brands. And that $50,000 number? That’s a daily rate. Snapchat recently said that Cosmo, one of its leading publishers, gets several million views per day on it’s Snapchat Discover feed. At the top of the image below is where Snapchat Discover ads are featured. The company has more than doubled its revenues from 2016. However, its operating income is still quite negative (part of it is due to the accounting recognition of administrative expenses). The profitability of the company so far seems tied to its ability to make its users hooked. Founded back in 2011, Snapchat is a camera company that was started by three Stanford students. The company grew so fast that Facebook’s CEO, Mark Zuckerberg offered $3 billion to acquire the company back in 2013. Snapchat’s founders turned the offer down. The company after only four years, in 2017 launched an IPO that valued the company at $24bln. As of February 16th, the company is worth $24.59 billion. The company business model is based on four main types of advertising. The high tier advertising (called Sponsored Discovers) can cost as much as $50k per day! The low tier advertising (Sponsored Geolifter) can cost as low as $5. The company has more than doubled its revenues in 2017. However, it’s still burning cash.